“First, we should move beyond the idea of a clear-cut sequence of peacemaking, peacekeeping and peacebuilding. These tools should be deployed in an integrated fashion, not kept in separate silos. Conflict seldom follows a tidy path. We must continue to evolve, towards a faster and more flexible architecture of response that allows us to customize our assistance to the real and immediate needs on the ground”. Peacekeeping and post-conflict peacebuilding are undergoing a shifting paradigm and focus in the international arena. Whilst the international community, via the medium of the universal body of the United Nations, has intervened in numerous and varied war ravaged countries and regions of the world since its inception after World War Two, keeping and then building the peace has been more complicated and protracted than originally envisaged. As the then UN Secretary General Kofi Annan lamented, half of those countries that emerge from war succumb back to violence within five years(1), emphasising the depressing fact that it is easier to make the peace than it is to keep it. History has shown us that the transition from internal conflict to a sustainable peace is a fraught one. Paradoxically, the number of inter-state warfare and armed conflicts around the globe is in decline whilst intra-state and internecine armed conflict is steadily rising(2); illustrating a growing trend that those countries and areas affected by post-conflict can be prone to have a propensity at relapsing back in to pre-conflict. As a response to such a structural change and trend in global and regional security is the decision by the United Nations to reinforce and reinvigorate its peacebuilding capacity, recognising its importance as the key to sustainable and tangible success. Acknowledgement of this ‘double sided coin’ of peacekeeping and post-conflict peacebuilding has been gradual and steady. Assisting national governments to strengthen their national justice and security institutions has traditionally been primarily for political considerations. The task of setting up a national and sovereign capability to provide internal capacity was not included in traditional peace-keeping operations; since the 1990’s, the main raison d’etre for post-conflict peace building was restricted to economic and social reconstruction. Then, in the last decade and in today’s peacekeeping nexus where operations are multidimensional, complex and more robust in nature, it has become increasingly accepted and expected that, in order to have sustainability and longevity of a credible sovereign national power and the chance to build upon a peacekeeping contextual environment, both the State and its internal support and capacity institutions must feel that it is not only its socio-economic elements that must be effective and empowering, but also high levels of national ownership via good governance and a credible security sector. This is highlighted very well by the fact that Western governments and other beneficiaries have specifically targeted peacebuilding in their donations and respective foreign relations policy. Post war reconstruction dates back to the Marshall Plan for the reconstruction of Europe and the subsequent bolstering of a war ravaged Japan. However, the term ‘peacebuilding’ itself is a relatively new word, both in vocabulary and terminology which, in turn, has encompassed a new set of expectations and commensurate capacities to facilitate peacebuilding during the post-conflict stage. In 1992, the UN Secretary General Boutros Boutros-Ghali defined peacebuilding in his Agenda for Peace as “action to identify and support structures which tend to strengthen and solidify peace to avoid relapse in to conflict”3. Peacebuilding therefore became synonymous with post-conflict peacebuilding “becoming necessary only after preventive diplomacy had failed to avert armed hostilities, after peacemaking had established the framework of a negotiated settlement and after peacekeeping had monitored an agreed ceasefire and presumably facilitated the restoration of a threshold of order”(4). In August 2000, the “Brahimi Panel”(5) interjected some intellectual rigour to this growing debate and made a profound comment that … “conflicts, more often than not, are preceded by a breakdown in the rule of law” and recognised the challenges for peacekeeping and defined the need for a “team approach to upholding the rule of law and respect for human rights, through judicial, penal, human rights and policing experts working together in a coordinated and collegial manner”…inclusive of … “an area in which peacebuilding makes a direct contribution to public security and law and order”; additionally seeing humanitarian demining as an …“essential complement” to effective peacebuilding(6). In 2001, the UN Security Council elaborated on this by defining peacebuilding as not just keeping previous protagonists at bay from returning to war but, for the first time, to examine and address the actual causes of conflict and even going further to encapsulate the development and promotion of democracy and development cooperation(7). Hence and up till the current time, whilst the term post-conflict peacebuilding8 has remained somewhat vague and lacking the analysis and policy associated with other UN departments, this is only a reflection of the relatively short time that post-conflict peacebuilding has been around and its distinctiveness from other terms within the UN spectrum, being intrinsically linked to conflict prevention, conflict management and post-conflict reconstruction. Following a Security Council resolution of the requirement for an intervention of a peacekeeping force, such an intervention should be seen as a short-term and expedient solution to a seemingly intractable problem. Normally commencing and manifesting in a humanitarian disaster, this is an absolutely critical period when any possible and practical opportunities for consolidating peace are at their highest but, at the same time, when the threat of a relapse back in to conflict is commensurately high. Unspeakable atrocities and human misery are central drivers to the desire to improve the general lot of the vulnerable peoples on the ground and efforts to assist and support the afflicted must be aligned with adequate resources and expertise. Politically challenging and harder to establish is the task of what comes next to build upon the good work and effort of the peace-keepers which has already gone in to such a fragile environment: that of building national capacity and security. Any realistic and long lasting peace will need the consent of its population and will stand the greatest chances of success when socio-economic and security governance issues are addressed. A government which is not credible or weak or illegitimate, possibly characterised by human rights violations and a sense of injustice and impunity among its population, where social programs for the rural community may be disproportionately under-funded and parochial, will adversely affect societal norms and what national and local government can tangibly deliver in face of legacy of a past conflict. Peacebuilding is multi-dimensional and multi-layered and, at its very basic level, must address the concerns of both the state and its population, in conjunction and in parallel with the political and socio-economic aspects of reconstruction. In its simplest sense, how can any war blighted country hope to move forward when it has former soldiers and combatants, regular and irregular, sometimes child soldiers, who are roaming unchecked in the countryside and cities; where large numbers of people have in their possession small arms and light weapons (SALW) and a culture of using their arsenal in order to survive; when police and army units are ineffectively led and unaccountable; when the intelligence apparatus is unchecked and abused; where anti-personnel landmines remain uncleared and their victims not assisted; where the basics norm of society have been denigrated over successive human rights violations and when previous perpetrators are not brought to justice, no reparations awarded and the legal regime not enforced. Following the distribution of the Brahimi Panel’s report in late June 2007, the General Assembly, whilst reorganising Department of Peace keeping Operations (DPKO), approved the creation of the Office of the Rule of Law and Security Institutions (ORLSI) within DPKO. This comprised of Police Division (PD), the Disarmament, Demobilization and Reintegration (DDR) Section, the United Nations Mine Action Service (UNMAS), the Security Sector Reform Unit (SSR) Unit and the Criminal Law and Judicial Advisory Service (CLJAS). The United Nations has deployed police officers for service in peace operations since the 1960s. Traditionally, the mandate of police components in peace operations was limited to monitoring, observing and reporting. Beginning in the early 1990s the UN police began helping to strengthen national policing capacity. Advising, mentoring and training functions were integrated into their monitoring activities. At the end of the 1990s, UN Police were called upon to provide interim law enforcement in Eastern Slavonia, Kosovo and Timor-Leste, and in 2000, the Panel on United Nations Policing and Peace Operations concluded that the role of the police in peace operations should be “to focus primarily on the reform and restructuring of local police forces in addition to traditional advisory, training and monitoring tasks”. The DDR Section of the Office of Rule of Law and Security Institutions provides back-stopping support to ongoing DDR programmes in peacekeeping operations, plans new DDR programmes, and provides advice on DDR aspects of Special Political Missions managed by the Department of Political Affairs. Other core tasks include serving as an expert resource to the Secretariat, inter-governmental bodies and Member States on issues related to DDR, and disseminating lessons learned and best practices on DDR in peacekeeping. DDR is a key post-conflict activity that aims to build the confidence between the parties, reinforce the peace process, and contribute to stabilization and early recovery. Spanning the whole spectrum of peacemaking, peacekeeping and peacebuilding, DDR is a multi-dimensional process that cannot be undertaken by one actor alone. DPKO therefore co-chairs the seventeen-member Inter-Agency Working Group (IAWG) on DDR, with the United Nations Development Programme (UNDP), which aims at developing a coherent UN system-wide approach to DDR(14). 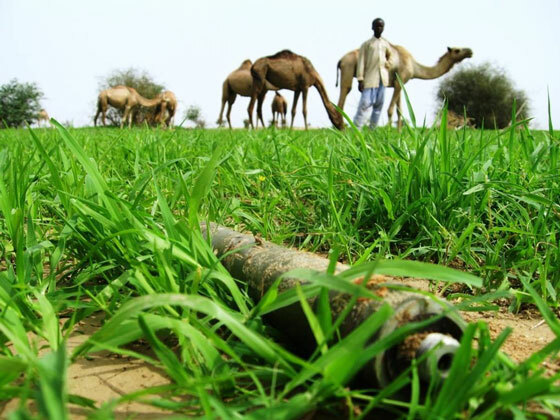 The United Nations Mine Action Service (UNMAS) is the focal point for the coordination of the UN effort to eliminate landmines and explosive remnants’ of war and to mitigate their impact on people’s lives. UNMAS is one of 14 UN entities that make up the “UN Mine Action Team.” The coordinating role that UNMAS plays promotes effective and efficient use of resources, prevents duplication of efforts and ensures that services are prioritized and targeted. And in that role, it is responsible for leading the monitoring of progress against benchmarks set in an inter-agency mine action strategy for 2006-2010. The strategy includes goals such as reducing death and injury by 50 percent, expanding freedom of movement for at least 80 percent of the most seriously affected communities and developing national mine action institutions. UNMAS also builds security and national capacities and enables development. It also ensures that UN peacekeepers can safely deploy in war-torn nations without undue risk or threat from mines and unexploded ordinance(15). 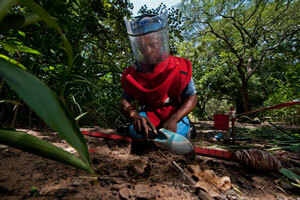 The United Nations Mine Action Service (UNMAS) also collaborates with 13 other UN departments, agencies, programmes and funds to ensure an effective, proactive and coordinated response to the problems of landmines and explosive remnants of war. UNMAS chairs the Inter-Agency Coordination Group on Mine Action, which brings together working-level representatives of the UN organizations involved in mine action to develop or revise policies and strategies, set priorities among UN players, and share information. UNMAS also coordinates meetings of standing committees, which were created when the Anti-Personnel Mine-Ban Treaty went into effect in 1999, and the Steering Committee on Mine Action, which brings together UN mine-action, nongovernmental and intergovernmental organizations, such as the International Committee of the Red Cross. Mine-action coordination centres managed by UNMAS are also responsible for public information and community liaison operations, victim assistance initiatives; collection of landmine and casualty data, provision of technical advice on destruction of landmine stockpiles, quality management for mine-action operations, and the destruction and removal of explosive remnants of war, which comprise unexploded ordnance (bombs, mortars and other explosives that do not detonate on impact but remain volatile and dangerous) and abandoned explosive ordnance, which are unused explosives left behind by armed forces. Security Sector Reform (SSR Unit) focuses on building effective, accountable and sustainable security sectors that operate within a framework of the rule of law and respect for human rights. To this end, the SSR Unit in ORoLSI brings together a small number of multi-disciplined specialists to provide a focal point and strategic SSR resource for DPKO and its peacekeeping operations, for other United Nations actors and for national and international partners engaged in supporting SSR. The SSR Unit, where requested and in close cooperation with other DPKO entities, provides support to SSR processes, primarily at sector-wide and political-strategic levels, including: facilitating national SSR dialogues after conflict; providing support for processes leading to reform of national security policies, strategies, plans and architectures; articulation of security sector legislation; strengthening management and oversight capacities, as well as national SSR coordination bodies; facilitating the provision of holistic and coherent United Nations support and assisting in the mobilization of resources for SSR (both human and financial); and monitoring and evaluation of SSR programmes and projects(16). The Criminal Law and Judicial Advisory Service (CLJAS) was established in 2003 to support United Nations peace operations in implementing their rule of law, justice and corrections mandates. Working closely with other ORoLSI components and concerned entities throughout the UN system and the international community, CLJAS advises, provides guidance and supports field missions on matters related to justice and corrections and assists with staff recruitment, resource mobilization and planning for projects and programmes. CLJAS also designs the justice and corrections components of new field missions and evaluates the achievements and challenges of existing missions(17). The creation of ORoLSI was a substantial move forward towards the broadly integrated team approach recommended by the Brahimi Panel, helping to empower DPKO by providing support to the rule of law and security institutions in post-conflict and politically fragile environments, thereby facilitating fundamental improvements in the strength and sustainability of the rule of law and of security institutions in the host State after a DPKO-led or other relevant Mission has left the country. Long-term peace consolidation and development are key to strengthening justice and security foundations in post-conflict peacebuilding settings. This should be within a contextual framework which works towards locally sustainable peace with justice and security that is pursuant with international human rights, norms and standards. ORoLSI compliments DPKO and the wider Organisation of the UN by assisting multi-dimensional peacekeeping operations. By participating through the life-cycle of United Nations operations, on-going initiatives and activities, ORoLSI’s respective components try and ensure, either singularly or collectively, dependant on the task(s) in hand, that personnel are deployed in a timely and effective manner. ORoLSI will continue to focus on working methods and practices, by managing growth and change, building coordination with implementing partners, in field operations and elsewhere within the United Nations. Additionally, the Office has close ties and working relationships with bilateral and international partners, as well as Governments and the recipient nations themselves. This extends to the formulation of an “exit strategy” for peacekeeping as it attempts to be the natural link by bridging the gap between immediate post-conflict situations and that of longer term development. The Secretary-General’s 2009 Report on Peacebuilding has now brought one of the main elements of peacebuilding to the forefront – that national ownership is essential. The harsh realities of previous and existing UN missions have underlined that ‘one-size’ does not actually ‘fit-all’ and from the very outset there must be clarity about the mandate and the desired outcomes of such intervention. It has been of paramount importance that the UN enter in to each new Mission with a specific plan, coordinated with national authorities and interested and affected actors. The scope of the pertinent peace agreement, the relative strengths and weaknesses of the national, regional and local authorities to engage, the degree of volatility on the country and the desire and capacity of other partners all create a specific dynamic to support the enabling provision of basic safety and security. The five sectors that fall within this remit of ORoLSI in the United Nations Department of Peacekeeping Operations (DPKO): police, justice and corrections, mine action, security sector reform and disarmament, demobilization and reintegration are crucial in this respect to work hand in hand with military, human rights and humanitarian actors to ensure a coordinated response in the immediate phase of post-conflict. Peacekeeping is evolving in its modus operandi and has undergone significant changes, both practically and theoretically, over the last sixty years plus. Traditional peacekeeping operations have been overtaken, but not supplanted, rather added to, by complex peacekeeping missions. Peacebuilding in a post-conflict arena has been an increasingly important element and interwoven series of viable security conditions which are fundamental to creating a sustainable peace. With the demise of the likelihood of a super-power nuclear confrontation, international relations has witnessed the exponential growth in the deployment of peace-keepers in direct response to the break-down of states and intra-state conflict. Security governance offers a crucial opportunity to link, phase, sequence and optimise the various components of post-conflict peacebuilding. Taken collectively and holistically, integrated and long-term approaches in post-conflict interventions help to tailor solutions that are appropriate to this new context. Coperation and confidence building in post-conflict societies facilitates ways to better understand and think at the local level and builds mutually reinforcing local and national ownership. The decision to create ORoLSI recognises this challenge and offers the crucial and unique mechanism to integrate different actors and approaches in the peacebuilding nexus. Ultimately, the delivery of the ORoLSI sectors in the early-post conflict phase will assist the Security Council in facilitating and achieving peacekeeping mandates which are more focused, integrated and sustainable. Mr. David Brazier is currently working as the Special Assistant to the Director at UN Mine Action Service; he served 5 years with the United Nations in a variety of roles within Department of Peace keeping Operations (DPKO) and Department of Field Support (DFS). 1 United Nations General Assembly, In Larger Freedom: towards development, security and human rights for all, Report of the Secretary-General, Addendum: Peacebuilding Commission, UN Doc: A/59/2005/Add.2 (23 May 2005), p1. 2 Townhall Presentation, 19 February 2009, UN Headquarters, Annual Review of Global Peace Operations, Center on International Cooperation, New York University. Doc.A/47/277-S/2411 (17 June 1992), para. 21. 4 Cousens, E.M., ‘Introduction’, Cousens, E.M., Kumar, C. (eds. ), Peacebuilding as Politics (Lynee Rienner:Boulder, 2001), pp. 1-20. 5 United Nations, ‘Report of the Panel on United Nations Peace Operations,”A/55/305-S/2000/809, 21 August 2000, paras. 14, 39, 40 and 42. 7 United Nations Security Council, Statement by the President of the Security Council, UN Doc. S/PRST/2001/5 20 February 2001). 8 United Nations Security Council, Statement by the President of the Security Council, UN Doc. S/PRST/2005/20 (26 May 2005). 9 Secretary-General, 16 April, 2010, report to Security Council. 10 Security Council, Statement by the President of the Security Council, S/PRST/2009/23. 11 Security Council, Statement by the President of the Security Council, S/PRST,2010/18, 23 September 2010. 12 Internet, UN News Centre, UN News Service, UN Rule of Law, Security Officials outline key priorities for 2008, p1. 13 Internet, United Nations Peacekeeping, Office of the Rule of Law and Security Institutions (OROLSI), p3. 14 Internet, United Nations Peacekeeping, Office of the Rule of Law and Security Institutions (OROLSI), p3. 15 Internet, United Nations Peacekeeping, Office of the Rule of Law and Security Institutions (OROLSI), p4. 16 Internet, United Nations Peacekeeping, Office of the Rule of Law and Security Institutions (OROLSI), p5. 17 Internet, United Nations Peacekeeping, Office of the Rule of Law and Security Institutions (OROLSI), p5. 18 Internet, United Nations Peacekeeping, Office of the Rule of Law and Security Institutions (OROLSI), p2.